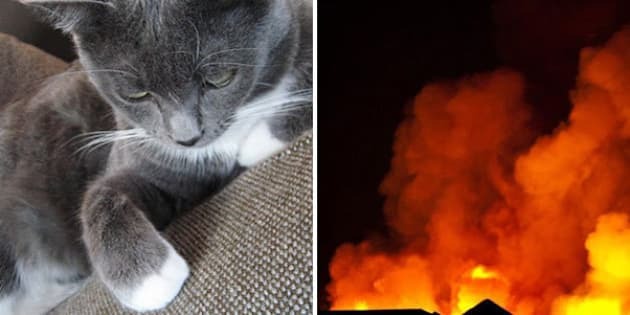 For months Megan Martin thought she has lost her cat, Harmony, to an Edmonton condo fire. Earlier this week, the pair were reunited in an astonishing story that proves the resilience of animals. Martin was one of the victims of a July 21 condo fire, that forced 400 residents from the Park Place South Hamptons complex. Martin told the Edmonton Journal when she first saw the flames on a neighbour's balcony she grabbed her infant son and fled. By time she remembered her cat, Harmony, there was no way to go back in the building. For weeks after she tried to find her cat. Edmonton's Saving Animals from Euthanasia (SAFE) Team, the organization where Martin adopted Harmony, offered help by leaving out water and food, in case the cat survived. Everything changed for Martin on Tuesday, when she was told a demolition worker at the destroyed condo found Harmony huddled inside a section of wall. Murray fed hungry Harmony a tuna sandwich and called SAFE Team to identify the cat. The cat was severely underweight, reports CBC News, but otherwise healthy. Martin told the Edmonton Journal she's excited to have her cat back in time for Christmas as that she's surprised Harmony survived.